One of the best things about dog breeding is watching our babies grow into being members of their families. We're very lucky to get to see many of our dogs' offspring regularly. In this photo, there are multiple generations of our dogs and some of the people who love them. 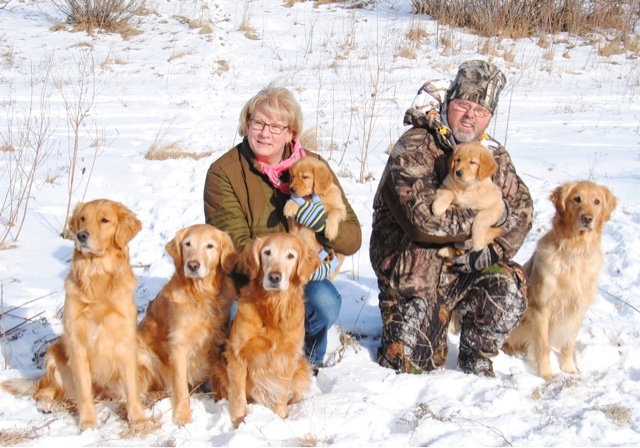 From left to right, Shannon (mom of puppies), Reba (Shannon's mom), Leia (Reba's mom), Jill and Toule (puppy), Rob and Piper (puppy). Piper will be heading off to live with Willow (far right), who is a Leia and Rowan daughter. Toule will head to Regina to live with Danno, a Leia and Rowan son. Escape from the whelping box! Merry Christmas - Love, the puppies!